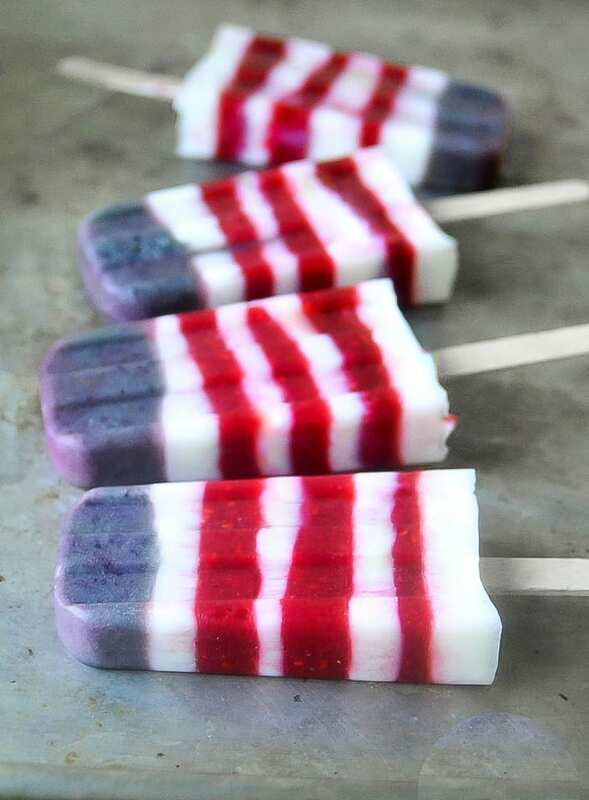 I’ll eventually get striped popsicles out of my system, but with Memorial Day (and the 4th!) coming up, I just had to try these. You don’t have to be a flag waver to flaunt a little Americana this season. There’s no food coloring or added sugar in these patriotic treats… just plump ripe blueberries and raspberries (or strawberries). Greek yogurt supplies the creamy white stripes. If you do a simple “red white and blue food” search on Pinterest, you’re going to see some day-glo treats out there. I’m all for national pride, but not with blue jello and red dye. These popsicles are actually healthy, so you can feel good about showing your colors , and eating them too. I use fresh summer strawberries for the stripes, pure yogurt for the white, and blueberries for the patch of blue. Old Glory never tasted so good! You’ll need a popsicle mold for this project, as well as some sort of blender or food processor to make your berry purees. You can also use paper cups as molds in a pinch. These pure fruit popsicles melt fast, so don’t take them out of the freezer until you’re ready to eat or serve them, they won’t last long in the hot sun. Lots of you have asked about what popsicle mold I use. I use one like THIS ONE because they are sturdy and I like the classic popsicle shape. I don’t use the plastic top that comes with it, though because it can get stuck when the sticks aren’t perfectly straight. A simple foil top works best, and I insert the popsicle sticks right through the foil. You can find wooden popsicle sticks HERE. For the sharpest stripes, have everything very cold before layering, that way the layers won’t tend to bleed into each other as much. Be sure to freeze each layer completely before going on to the next. 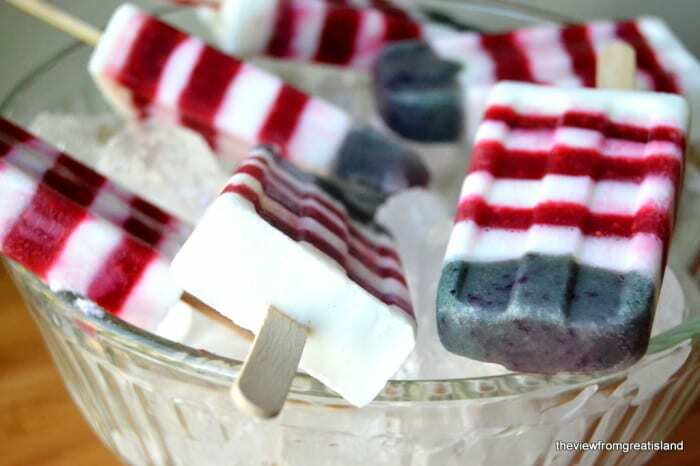 Don’t forget to pin these Red White and Blueberry Yogurt Popsicles! I know this is an old post, but I just made these and the layers bled into each other :( I froze for many hours in between, even overnight for one layer, and the colored layers seeped into the white layer in little lines. I’m wondering if it is because I used plain Fage yogurt instead of sweetened vanilla yogurt? Have you ever had this happen? I tends to do that, Ann….it helps to have each layer VERY cold before you add it to the previous frozen layer, does that make sense? Because there is such a difference between the white of the yogurt and the colors of the berries, it’s hard to get it really sharp. Hope this helps. It’s really important to be sure the ingredient you are adding to the frozen pops is as cold as possible. The muddying you are getting is due to the warmer liquid melting a bit of the frozen stripe before it and then mixing with it. The colder the liquid you are adding, the less melting there will be. It also helps if the frozen part is very cold; I keep my freezer at 0°F. Love your blog and these popsicles – so creative and festive (and they look super yummy)! These are impressive! But if you have to wait more than an hour for each layer, it will take all day? That would make them even more impressive!! I need to show this to my cousin, she is an expert with these. We have to try it. Looks good! Hi! What is the carb count on these? I found these through a low carb 4th of July search but seeing as though there’s yogurt and blueberries, they don’t sound very low carb. I’m not sure what the carb count would be, sorry Brianna! Oh my goodness this is fantastic! It’s 102 degrees here today and these would be a welcome treat. I will be sharing your frozen yumminess at Katherines Corner tomorrow. Hugs! Thanks Katherine – stay cool! Just came across this! They look so good. Can these be made with regular vanilla yogurt? (Not a fan of Greek yogurt). Thanks for sharing! Have you ever tried to make these with frozen raspberries/blueberries? I only ask because all of our local grocery stores are out of almost all of their berries and I was hoping to make these for a party tomorrow! You can definitely make them with frozen berries, there won’t be much of a difference at all — have fun! 4th of July Desserts to complete your Independence Day celebration! Every 4th of July Cookout Recipe You'll Ever Need - What Dress Code? My popsicle mold makes 10 pops. Good luck Sarah! Holy cuteness! Can’t wait to try these! I am including these in my blog of Independence Day treats tomorrow. I will link back to your original post. Thanks for sharing! Red, White & Blue American Flag Desserts for July 4th | SADIERAE + CO.
these are absolutely the most beautiful popsicles I’ve ever seen! So festive and the colors are GORGEOUS!! Have a happy 4th and enjoy the rest of your weekend! They usually come with some sticks, and you can also buy more on Amazon. But Staples and most big stores like Target sell plain wooden popsicle sticks, too. Hope you have a blast this summer with your grand kids! The problem with blueberries is that there are many different varieties, and each one is a little different in color. If yours are really purple. you can add a few drops of blue food coloring to bring up the blue color. Go slowly and stir well because a little coloring goes a long way! Thanks Sue! I’m going to try that, because once frozen, the color turns to be brownish, which doesn’t look very appealing. The funny thing is, I think it depends on the kind of blueberry you have. There are lots of different varieties in the stores, and they have different color properties. Hi! Love the popsicles! I would wrap a little foil around the end of the stick so that when you pour the mixtures it won’t get mall over. Love this idea! Can’t wait to try them….. These turned out absolutely gorgeous! What a fun and festive treat for 4th of July! I’m going to give these a try! I tried to be careful and avoid the stick as I layered, Chelsey, but it is a bit of a challenge. I thinned the yogurt and the berry purees so that I could basically ‘pour’ them in with a small measuring cup with a spout. Hi Sue, saw your photo used on the instagram of “hautehippieofficial” for Memorial Day and had to go on a google image search to find these exact ones!! So happy I found you and the recipe. 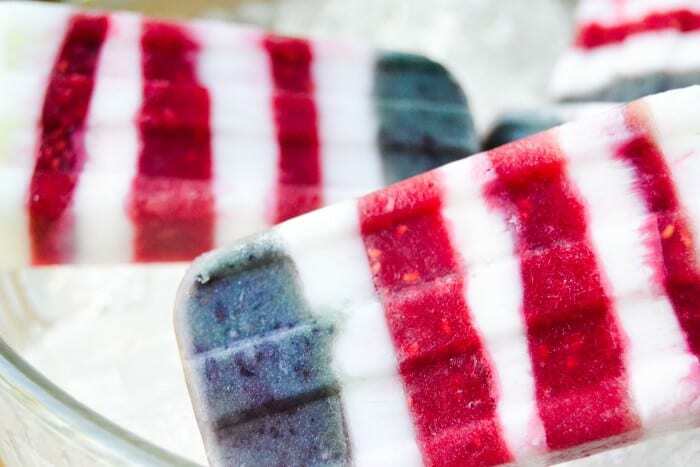 These are by far the best looking patriotic popsicles I have ever seen! So beautiful and picture perfect. Thank you for sharing and can’t wait to make them. Buying the mold now for my four kiddos who are 10,8,6 & 4. It’s going to be a great summer in Colorado. Hey Thanks Amber for taking the trouble to find me! I hate it when things are shared without the link. Glad you made it here, and let me know how the pops turn out! These popsicles look amazing Sue. 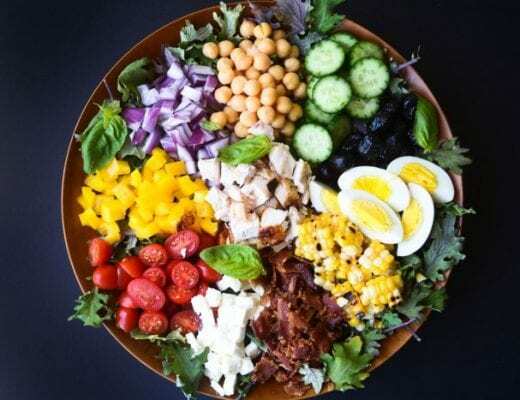 I just found a photo of them on The Entertaining House’s blog post “10 inspiriting ideas for your Memorial Day & summer entertaining” with a click-over to your site. Thanks for letting me know, Sam! Have a wonderful weekend! 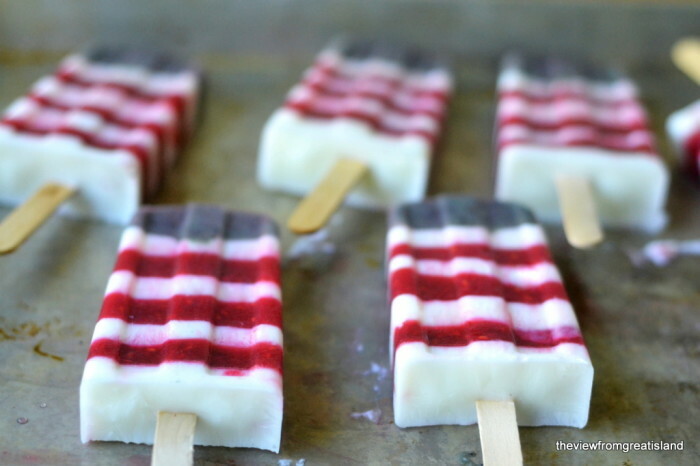 I’m glad you’re not over striped Popsicles yet, because I puffy heart love them! 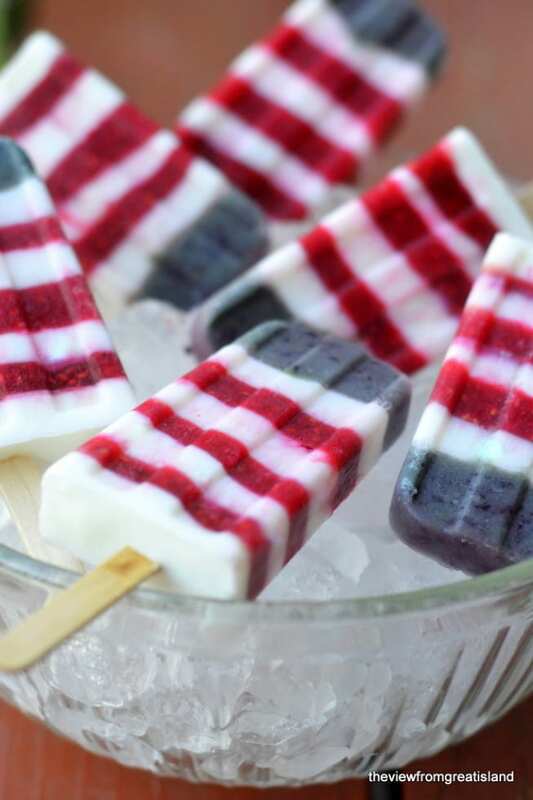 Especially these flag Popsicles! :) So cute! Pinned! I’m so impressed by your popsicle recipes. I was searching for ideas of what to make for our Memorial Day barbecue, and now I can stop looking. These will be on my weekend agenda, for sure. They would almost be too pretty to eat (almost!) if they didn’t sound so delicious. These look amazing, and so festive! I’ve gotta get a mold for this summer! Be sure to stop by next week for 7 days of popsicle inspiration! These are the most beautiful popsicles I’ve ever seen! I’m sure they’re delicious too. Love the rich colors. These are absolutely gorgeous! And so simple with amazing ingredients. I’m pinning this for sure! how patriotic! they seem so easy to make too–very clever of you, sue! I ordered popsicle molds right after you posted the first stripes. I didn’t make the stripes, but I have been making a pineapple-coconut blend that totally wiped out my Outshine bar habit …my bedtime snack. However, I think I need to do these red-white and blues – so much fun and perfect flavor combo! 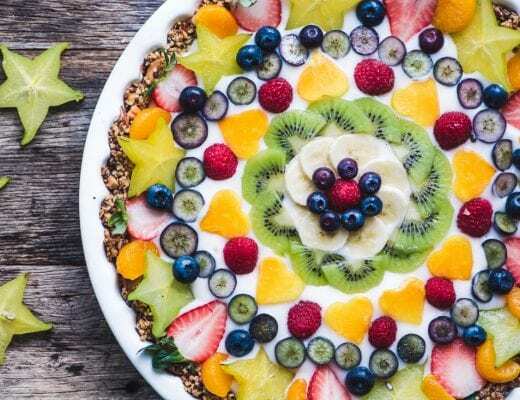 I’ve been thinking of adding some yogurt to my pineapple-coconut blend so am now inspired to do that also. Thanks! That’s so funny because I just this second pulled pineapple pops out of my mold! Just looking at those makes me happy! They scream summer! And thank you for the link and tips to the molds. I will be picking some up so I can make these with my kids!! Wow wee, these popsicles are so much fun. I’m definitely making them for the 4th of July. I love these pretty (and healthy!) pops. Perfect summer treat! These look beautiful and sound delicious. Love them!! Now i know I’m ready for summer. Thanks, Sue! wow Such a simple yet wonderful idea! You are so creative, Sue. Love these popsicles. You’re the Queen of all things Popsicle, Sue! One question – I am the only one in the house who eats and loves them. Any suggestions for keeping them once they’re been unmolded? You can wrap them in waxed paper, or put each one in a baggie. Bookmarked! My kids will devour these beautiful treats and I will have fun making them. These are so great and look so perfect!!! Seriously!! Cannot get over how cool these are! Beautiful!! Beautiful! 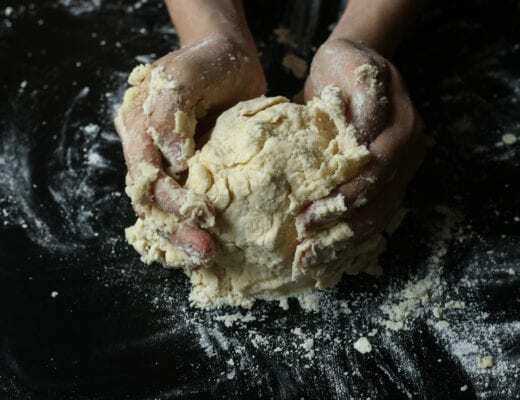 You have an artistic gift with food. Love these. So pretty. I love that you made them healthy too. :) Love the artistic way you create food. You are my Queen Of Pops!? Where is the mold from Sue? Love the classic line..lol:) But I do..
Amazing Sue, just amazing. Only you could make popsicles so beautiful. I do feel like I should start sing the Star Spangled Banner. Oh, but I’m positively sure you don’t want to hear me sing : Love these!! You are amazing Sue! These are unbelievably gorgeous – the photos, the idea, the layering – I’m in love! I need Popsicle molds!!! How pretty! I happen to know two little boys and lots of adults who would love these :) That Popsicle mold has been on my wish list for a while – need to go ahead and buy it. How cute they would be in all the grandkids hands (or mouths) for a Fourth of July photo shoot! All your popsicles are amazing but these are glorious. Stunningly beautiful. Wow! Seriously, I am in awe of these. And so easy and simple to make! A summer must here. Thanks!